Fiberart International an Exhibition Of Contemporary Fiber Art will be presented by the Fiberarts Guild Of Pittsburgh, Inc. at Pittsburgh Center for the Arts, 6300 Fifth Avenue, Pittsburgh, PA 15232 and the Society for Contemporary Craft, 2100 Smallman Street, Pittsburgh PA 15222. Organized by the Fiberarts Guild of Pittsburgh, Inc. this triennial exhibition features 85 exceptional works that are pushing the boundaries of fiber art. The show will run April 16 - August 22, 2010, with an opening reception: April 16th, 5:30 - 8pm. 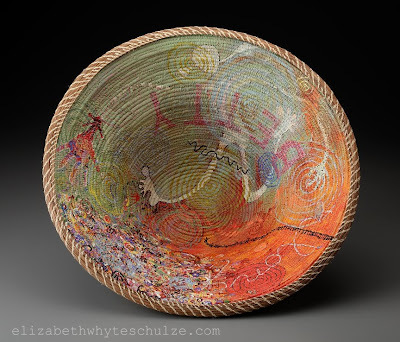 Basketmakers Elizabeth Whyte Schulze and Joh Ricci have had works accepted into this show. Joh's piece Indian Summer will also be on view. Visit BasketMakers.com for more about coiled or knotted basketry.